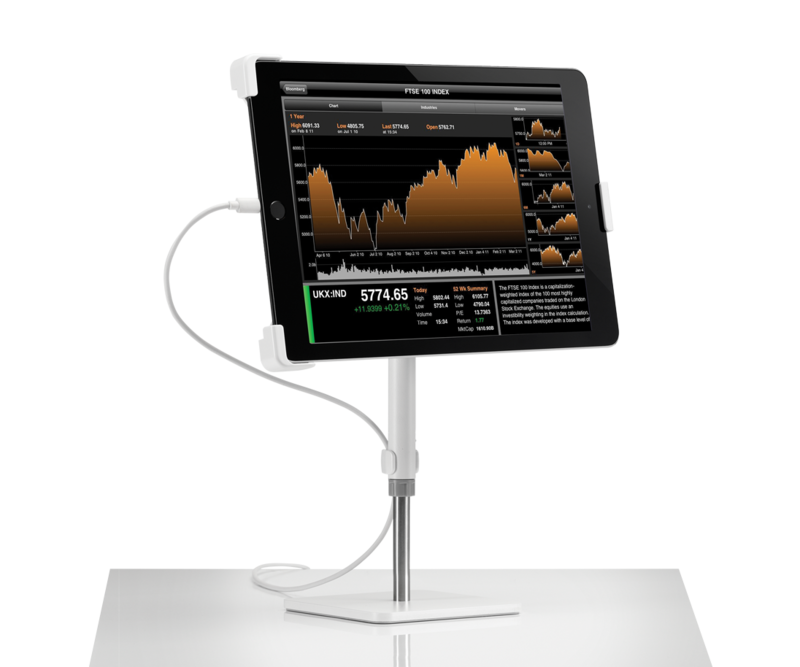 Tabetha is an innovative desktop mount for 7” to 12.9” tablets. Three adjustable and lockable arms means tablets can be moved in to the perfect position for the user, not the other way round. Interact. Collaborate. Input data. Watch content. Tabetha turns around tablet use. Most people look down at their mobile device for extended amounts of time, which negatively impacts posture by straining the neck. Tabetha’s easy height and orientation adjustment encourages users to move their tablet to exactly where they need it, for any and every task. Tabetha helps people interact seamlessly with their tablet. It can be viewed alongside their primary screens, and can therefore be used to full effect with other desktop technology. This in turn opens up possibilities and increases productivity by allowing users to share and access information, and collaborate with others. Tabetha can be vertically adjusted up to 100mm, and has a twist lock feature to secure the tablet at its optimum height. As well as facilitating a seamless switch between landscape and portrait mode, it provides a 50-degree screen tilt movement for ultimate visibility and user comfort.